Nazarene Compassionate Ministries projects around the world. People in Liberia are still experiencing the effects of a brutal civil war that lasted 14 years. The war destroyed infrastructure, including water supply and sanitation. There is no piped running water. Sewer drainage is non-existent in many towns and is blocked in most parts of the capital, Monrovia. Because of the violent conflict, many people moved from rural areas to live in Monrovia, which added additional stress on water and sanitation systems. Today, only 1 in 5 people has access to improved sanitation facilities, and nearly 1 in 5 deaths is caused by illness related to poor sanitation and unclean water, including diarrhea, cholera, and typhoid fever. The church in Liberia is working to improve the sanitation and health conditions of families in Monrovia and Grand Gedeh. The Liberia Latrines Project will start by constructing 12 large pit latrines (4 compartment model) in 12 neighborhoods, which will improve the well-being of more than 25,000 people. Improved sanitation will lead to less contamination in the water supply and fewer deadly illnesses, and ultimately it will lead to transformation of families and communities. This project will bring the church close to its communities, and it will show the love and care of Christ in a tangible way. 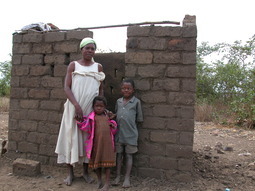 The cost of materials for each latrine facility is $2,500 USD, and the labor to built the latrines is provided by the local community. Be sure to put ACM1858 in the Memo area. Thanks for your donation.